Polishing 52,000 square feet of floor is never an easy task, but some jobs can be more demanding than others. This was one of them. It took contractor Darryl White and a crew of five 11 weeks to prep, polish and finesse the artwork for the floors of Alabama Robotics Technology Park, a robotics maintenance training center in Tanner, Ala. It celebrated its grand opening Nov. 10. The biggest obstacle White had to overcome was getting the facility's floor in the 4,000-square-foot front lobby to the specified 5/8-inch recessed depth. "We wrote the specs for how to do the recess work and gave them to the (installing) contractor and GC, who did it the way they wanted anyway, " says White, owner of Concrete Flooring Solutions, based in Alabaster, Ala. Subsequently, his crew had to bushhammer out the 1 5/8-inch overage with a jackhammer and bushing tools after the building - which features a 58-foot glass curtain wall - was already built. To make matters worse, the lobby's underground air ventilation system had to be completely redone to get the floor back to architectural specifications. When that was accomplished, White's crew applied 5/8 inch of Rapid Set TRU, a hydraulic cement manufactured by CTS Cement. During the application they simultaneously seeded and broadcast 3,500 pounds of multicolored recycled crushed glass at the same time. Then using HTC diamonds and grinders, the floor was ground wet and polished dry to 800 grit, White says, noting that the 11-step process started with a 60-grit steel diamond. "When we were done, it turned out to look like a sheet of glass. Considering we had to jackhammer it out, it was a pretty amazing feat. 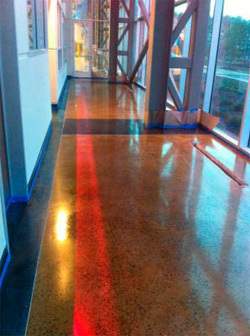 We do more than 1 million square feet of polished concrete a year and I've seen it all. This was a huge leap in the overlayment process. " Besides polishing, the job also entailed coloring the topping in a crosswise pattern with three different L.M. Scofield acetone liquid dyes. The crew also used a mongoose concrete saw to cut and score various geometric shapes into the floor, grouting the saw cuts to create a level surface. White has nothing but praise for the TRU topping. 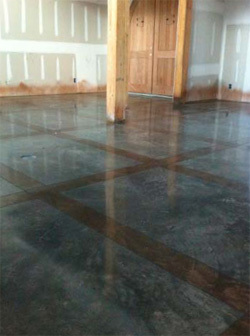 "TRU is a wonderful substitute for concrete because it's similar to polishing regular concrete. That's what makes working with it so nice. "It colors and saw-cuts well. We found we can do some pretty amazing stuff with it." Diamond tools, and how they’re used, can make the difference between a profitable polishing job and a not-so-profitable job. So how should contractors select tools that are long lasting and deliver what they want? Read on. As a former contractor, manufacturer and now basically an owner’s representative on most projects, I’d like to share a relatively simple formula that will handle this issue for 90 percent of your projects.